This is the badge for recipients of the Medal of Freedom. The official meeting room of The Royal Kingdom of Habbo. Come and enjoy an authentic Japanese meal at the Habbo Sushi Bar & Restaurant. Founded by LaLaaLoopsy and Phusion on Nov. 22nd, 2016. JOBS AVAILABLE! HIRING IMMEDIATELY!! Royal Family members meeting room. Congratulations! You have shown outstanding bobba valliant fight to make The Kingdom of Habbo a great place to be! 10c more to you on top of your daily pay! Please collect your bonus pay at the weekly Saturday Meetings! Ability to promote up to Castle Worker. All members of this badge are apart of the Ceremonial Events team of the Kingdom. All members of this badge are apart of the Civics Affairs team of the Kingdom. Ability to promote up to Warlord. Ability to fill the security simulator. All members of this badge are apart of the Commissioners team of the Kingdom. Ability to promote up to Colonel. 4iC-Thurs, it is required of the Leader of the Council of Commoners to tell the Commons the news of the week prior as well as any business to be conducted during the week of. The Leader is responsible for conducting business in the Counicl of Commons. All members of this badge are apart of the Diplomatic Affairs team of the Kingdom. Ability to promote up to Captain. Ability to promote up to Sergeant. Ability to fill the gaurd post in the Kingdom. The High Lords of the Kingdom of Habbo are the leaders of all teams and affairs happening within and beyond the Kingdom of Habbo. High Lords are all considered 5th in line for the crown. The Phoenix Army becomes more and more capable of finishing their life’s work to create peace and fellowship bobba all of those who chose to journey into the Kingdom of Habbo. Long Live the Pheonix Blood Angels! For Erelim! The House of the mighty Lynx reassures the Kingdom of Habbo of protection and guidance towards the future. Long Live the Lynx of Perception! For Giraldus! Throughout the Kingdom hearts live in fear of the inevitable inferno destined to rise from the ashes of the most prominent and profound Royal House surviving the Kingdom of Habbo. Long Live the King of Dragons! For Ravrinth! Ability to promote up to Clergy. Knighted by the Queen of Habbo, the Knights of the Round Table represent and defend the honour, duty and the Crown of the Kingdom of Habbo. Considered apart of the Royal Family as 4th in line for the Crown. Members of this badge are in the Library Unit. Library Unit keeps all data on active members to ensure progression throughout The Kingdom. Ability to fill the guard post. Ability to promote up to Naval. Members in this group are apart of the Online Services Unit of the Kingdom of Habbo. Members maintain any and all online profiles fuctioning from The Royal Kingdom of Habbo. Complete your Prestige Pay Duties and complete your Prestige Pay Badge Request form on the forum. Then request this badge 15 minutes before Pay Lines begin to collect your extra 10c earnings. The founders of the Kingdom and apart of the Royal Family and are considered 3rd in line for the Crown. Her Royal Highness, Princess -Kaylalicious. Ability to Fill Welcome Station. All members in this badge are on strict probation within the Kingdom for insufficient work ethic. These members have had their divisional badge removed and are forbidden to transfer until probation has been lifted. LaLaaloopsy of House Ravrinth the First of Her Name, The Unburnt, Queen of Habbo and the First Men, Queen of Pixels, Khaleesi of the Great Grass Sea, Protector of the Realm and the Six Kingdoms, Breaker of Chains and Mother of Dragons. All members and member accounts on this badge are apart of the Royal Reinforcements team of the Kingdom of Habbo. Ability to Fill the Help Desk. Ability to promote up to Trades Worker. The Royal Kingdom of Habbo's official football team and stadium. The 6th in line for the crown. The KoH Transfer Unit members are the only members allowed to transfer people into The Royal Kingdom. Any other transfers done by any other member are invalid. Ability to fill the training simulator. This Treaty aims to create a safe and friendly environment on the Agency Floor to combat illegal warfare and those that engage in it. Signed by: USDF, HQUS, MinDef, WH and HIA. Welcome to the one and only Kingdom of Habbo! Join today and become royalty tomorrow. Pays ALL DAY DAILY. Slay dragons, save princesses, develop your own identity here at the only Royal Fantasy themed agency! ~Established Nov. 2014 by LaLaaLoopsy. Celebrate the new generation of KoH! The official office of The Queen, LaLaaLoopsy. Welcome to Habbo's newest Sushi Bar. For info on jobs, contact someone on the green sticky in the manager's office! Press Conferences with the Queen occur weekly, every Friday at 9pm GMT+0. Come and let your voice be heard! In accordance to the Alliance Collaboration, KoH, SWAT, SS, FBI and WH are all invited to join in on the Alliance Movie Night! Celebrate birthdays monthly with KoH! Sell your wares to the public in The Village Coin Shop!© Meet new people, have fun, join The Kingdom of Habbo for more adventure! Enjoy a drink with your best pal Winston! Meet new people and have a good time! 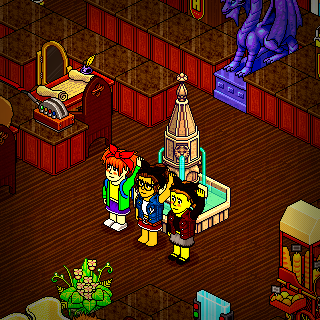 Join The Kingdom of Habbo for more adventure! The Kingdom of Habbo's Architectural Operations courses are availble to those who wish to recieve a degree on internal affairs. Official sponsers of The Royal Kingdom of Habbo. Taken in this room on 17 January 2017 and received 2 likes. Taken in this room on 17 January 2017 and received 0 likes.